Home→Mods, Tech Talk & Tips→Gadgets and Tools→Kudos to SodaStream! A Warm and Fizzie Feeling! Kudos to SodaStream! A Warm and Fizzie Feeling! These days it seems that companies with bad products or services get all the press and the good guys get taken for granted. So when we run into a vendor that goes above and beyond we think they deserve a little positive press – here is one of those cases. In summary: much to our amazement, a malfunctioning soda making carbonator that we originally purchased in 2005 was replaced by SodaStream after 7 years with a brand new unit free of charge – we didn’t even have to pay shipping! Wow! Read on for the details. If you are not familiar with Soda Stream a bit of explanation is in order. Years ago we decided to reduce our intake of highly processed carbs including refined sugary beverages like soda. To ease the transition we began drinking carbonated water (seltzer) and soon realized that a good portion of the “fun” of drinking soda is in the fizzies and after a while found we didn’t miss the sugary flavoring at all. On the down side drinking seltzer vs. plain water can be costly, plus massive quantities of plastic bottles are involved. 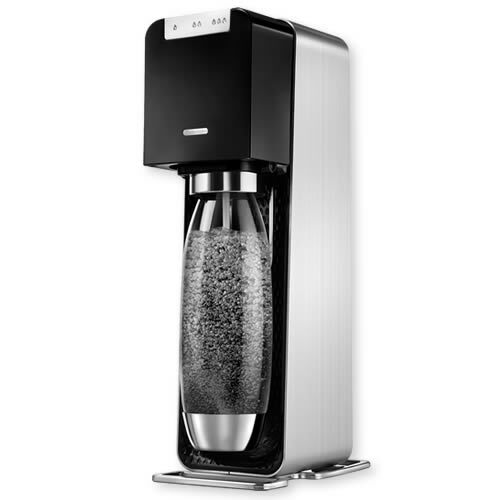 Because we tend to drink up to several liters per day, we decided to try a home fizzing product and purchased our first SodaStream in 2005. SodaStream makes and markets consumer affordable carbonating devices and our first unit was one of their original models (the Fountain Jet – photo above left) which we keep in our kitchen next to the refrigerator. 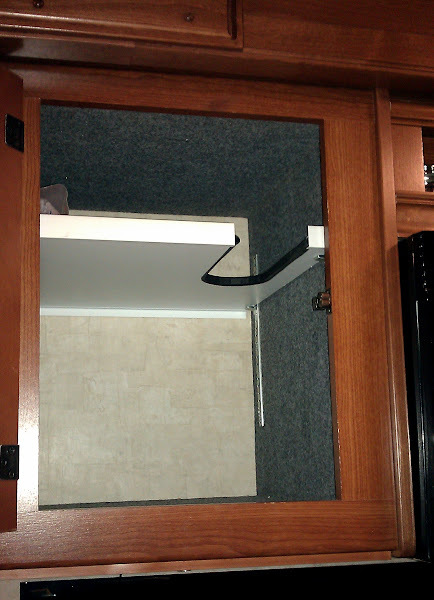 Since then we have purchased two additional units, a Fountain Jet for Quantum Leap (our boat) and recently another slimmer Genesis unit for the coach – the photo right shows its home in a cabinet in our bus complete with its own custom cut niche in the shelf to keep it secure – this turned out to be a great spot and we don’t even need to remove it to use it). 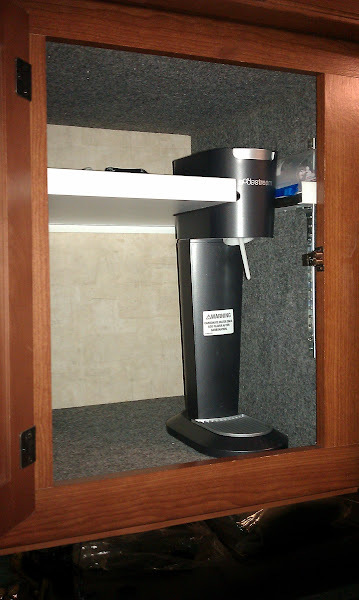 When you have limited space, a SodaStream is a must have as there is no need to lug around cases of water or soda! How many bottles of carbonated water have we made? On average we probably carbonate 3 -4 liters per day so the simple answer is lots and lots! All the SodaStream carbonator models run off a cylinder charged with CO2 and require no electricity or batteries. Each “slim” cylinder can fizz an average of 60 liters (depending on how fizzy you like your soda) and when empty can be exchanged for a full unit at various retail establishments. We typically use Bed Bath & Beyond and almost always have a 20% off coupon, so a refill typically costs us $12 – or about $0.20/liter. 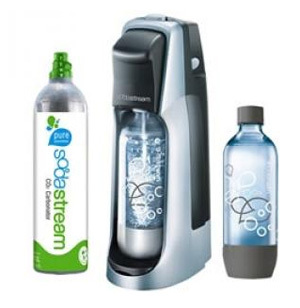 There are many other stores now that can exchange carbonators – see the SodaStream website for details. If you don’t think unflavored fizzy water would make you happy, many flavors are available in Diet and Regular formulations. A sample pack comes with most new SodaStream models and your favorite flavors can be purchased at many local stores (including Wal-Mart) in 500mL bottles (a little over a pint). Each 500mL makes at least 12 liters and the cost is $5-$7 for most flavors and $10 for specialty flavors. The nice thing about this system is you have full control over not only the intensity of the fizz but the intensity of the flavor too! The only “soda” we make regularly is Tonic water and we find using half or less of the recommended amount of concentrate is more to our liking. This provides us with over 24 liters of finished product per 500ml bottle or about $0.21 per liter. Total cost then is about $0.41 for a liter of fresh tonic water or other soda with no plastic bottle waste. When our original unit stopped working in 2005 the problem was with the carbonation valve assembly. Normally the unit will “buzz” loudly when enough pressure has been achieved to carbonate the water. In our case, it didn’t buzz but would only hiss, leaving the bottled water only partially carbonated. Since it was still under the 3 year warranty, when we called Soda Stream, they immediately shipped us a replacement unit. We were impressed by their customer service back then. But we were even more impressed a few weeks back! One day we started having the same problem – just hissing, no buzzing and incomplete carbonation so I went to Soda Stream’s website (I had forgotten that we had had the same problem in 2007) and filled out their online contact form, explaining the problem and asking what we should do. I figured I would not hear from them for a few days but lo and behold, within an hour, a Soda Stream Customer Service rep called! Unfortunately I missed the call so she left a message. They also sent me an email telling me that a trouble ticket had been opened and for me to contact them anytime (they have 24/7 support) so they could help me resolve the problem. The next day, I returned their call and with Rob’s assistance we walked through several troubleshooting steps. Since nothing we tried fixed the problem, Maureen, the rep, said that she was placing an order for a new replacement Fountain Jet to be shipped to us free of charge. We would receive it in 7 – 14 days and once received, we would need to ship the defective unit back (at their expense). Wow, how impressive is that! To replace the 5 year old, out of warranty unit with a new one (which retails for at least $80 and not even charge for shipping) is in our opinion worthy of praise! How often do you find a company that stands so solidly behind their product! So if you want to do away with lugging heavy bottles from the grocery store, finding room to store all of them while reducing the number of bottles thrown into the landfill or having to be recycled, a SodaStream is a must have! You can’t beat their product and obviously you can’t beat their excellent customer service! SodaStream plastic water bottles are marked with an expiration date and should be discarded when expired. Some models are available with glass bottles. Always fizz the water before you add the flavoring or a great mess will result! We know! Three “buzzes” of the carbonator is for average fizz – maybe even a little above average. Carbonate to taste by choosing your favorite number of “buzzes”. The original Fountain Jet came with a large CO2 cylinder capable of fizzing 130 liters. The large cylinders are still available on the SodaStream website but must be shipped back for exchange. None of the local retailers that exchange cylinders carry the 130L version as far as we know. 2015-08-27 UPDATE: The 130L cylinders have been available for some time now at certain retailers such as Bed Bath & Beyond and Staples. Not all models of the SodaStream carbonators can accept the 130L cylinders. We prefer the 130L cylinders because they can be less expensive per fizz (particularly with the commonly available BB&B 20% off coupon) and obviously last twice as long. Some people have found that they can get their cylinders recharged at a welding or paintball supplier. Also some shops catering to beer making may be able to refill the cylinders. However an adapter will need to be purchased (not from SodaStream – Google it). For us, the pricing is reasonable and it is just more convenient to exchange the empty cylinders at the various nationwide retail outlets.